For patient education information, see the Heart Health Center, as well as Supraventricular Tachycardia (SVT, PSVT), Atrial Fibrillation (AFib), Atrial Flutter, and Arrhythmias (Heart Rhythm Disorders). SVT and paroxysmal SVT are triggered by a reentry mechanism. This may be induced by premature atrial or ventricular ectopic beats. Other triggers include hyperthyroidism and stimulants, including caffeine, drugs, and alcohol. Sinus tachycardia. Note that the QRS complexes are narrow and regular. The patient's heart rate is approximately 135 bpm. P waves are normal in morphology. Underlying physiologic stresses such as hypoxia, hypovolemia, fever, anxiety, pain, hyperthyroidism, and exercise usually induce sinus tachycardia. [12, 13] Certain drugs, such as stimulants (eg, nicotine, caffeine), medications (eg, atropine, salbutamol), recreational drugs (eg, cocaine, amphetamines, ecstasy), and hydralazine, can also induce the condition. Treatment involves addressing the basic underlying stressor. Atrial tachycardia. The patient's heart rate is 151 bpm. P waves are upright in lead V1. Multifocal atrial tachycardia is a tachyarrhythmia that arises within the atrial tissue; it is composed of 3 or more P-wave morphologies and heart rates. 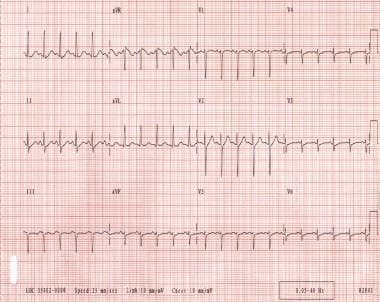 This arrhythmia is fairly uncommon; it is typically observed in elderly patients with pulmonary disease. The heart rate is greater than 100 bpm, and electrocardiographic findings typically include an irregular rhythm, which may be misinterpreted as atrial fibrillation (see the image below). Treatment involves correcting the underlying disease process. [20, 21, 22] Magnesium and verapamil may sometimes be effective. Multifocal atrial tachycardia. Note the different P-wave morphologies and irregularly irregular ventricular response. Atrial flutter. The patient's heart rate is approximately 135 bpm with 2:1 conduction. Note the sawtooth pattern formed by the flutter waves. Atrial fibrillation. The patient's ventricular rate varies from 130-168 bpm. The rhythm is irregularly irregular. P waves are not discernible. When atrial fibrillation occurs in young or middle-aged patients in the absence of structural heart disease or any other apparent cause, it is called lone or idiopathic atrial fibrillation. Atrioventricular nodal reentrant tachycardia. The patient's heart rate is approximately 146 bpm with a normal axis. Note the pseudo S waves in leads II, III, and aVF. Also note the pseudo R' waves in V1 and aVR. These deflections represent retrograde atrial activation. Same patient as in the previous image. 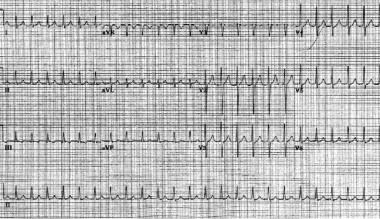 The patient is in sinus rhythm following atrioventricular nodal reentrant tachycardia. An understanding of the electrophysiology of AV nodal tissue is very important in comprehending the mechanism of AVNRT. In most people, the AV node has a single conducting pathway that conducts impulses in an anterograde manner to depolarize the bundle of His. In certain cases, AV nodal tissue may have 2 conducting pathways with different electrophysiologic properties. One pathway (alpha) is a relatively slow conducting pathway with a short refractory period, while the second pathway (beta) is a rapid conducting pathway with a long refractory period. The coexistence of these functionally different pathways serves as the substrate for reentrant tachycardia. [3, 23, 24, 9] Electrophysiologic studies have demonstrated dual AV nodal pathways in 40% of patients. The onset of AVNRT is triggered by a premature atrial impulse. A premature atrial impulse may reach the AV node when the fast pathway (beta) is still refractory from the previous impulse but the slow pathway (alpha) may be able to conduct. The premature impulse then conducts through the slow pathway (alpha) in an anterograde manner; the fast pathway (beta) continues to recover because of its longer refractory period. Image A displays the slow pathway and the fast pathway, with a regular impulse being conducted through the atrioventricular node. 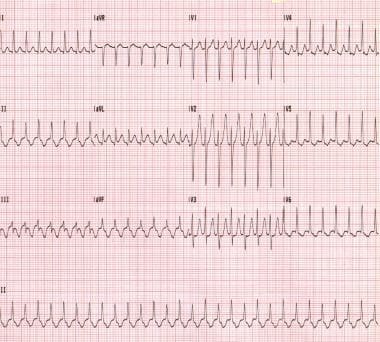 Image B displays a premature impulse that is conducted in an anterograde manner through the slow pathway and in a retrograde manner through the fast pathway, as is seen in typical atrioventricular nodal tachycardia. Image C displays the premature impulse conducting in a retrograde manner through the pathway and the impulse reentering the pathway with anterograde conduction, which is seen commonly in patients with atypical atrioventricular nodal tachycardia. AVRT is another common form of paroxysmal SVT. The incidence rate of AVRT in the general population is 0.1-0.3%. AVRT is more common in males than in females (male-to-female ratio of 2:1), and patients with AVRT commonly present at a younger age than do patients with AVNRT. AVRT is associated with the Ebstein anomaly, although most patients with AVRT do not have evidence of structural heart disease. Wolff-Parkinson-White pattern. Note the short PR interval and slurred upstroke (delta wave) to the QRS complexes. Importantly, note that not all accessory pathways conduct in an anterograde manner. Concealed accessory pathways are not evident during sinus rhythm, and they are only capable of retrograde conduction. Orthodromic atrioventricular reentrant tachycardia. This patient has Wolff-Parkinson-White syndrome. The left image displays the atrioventricular node with the accessory pathway. The impulse is conducted in an anterograde manner in the atrioventricular node and in a retrograde manner in the accessory pathway. 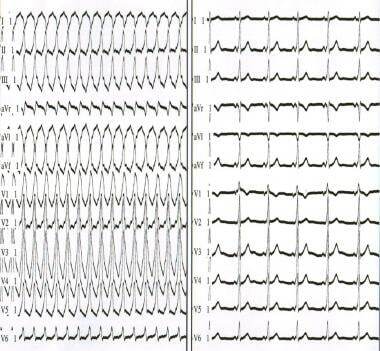 This circuit is known as orthodromic atrioventricular reentrant tachycardia and can occur in patients with concealed accessory tracts or Wolff-Parkinson-White syndrome. The right image displays the impulse being conducted in an anterograde manner through the accessory pathway and in a retrograde manner via the atrioventricular node. 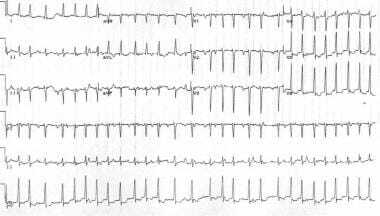 This type of circuit is known as antidromic atrioventricular reentrant tachycardia and occurs only in patients with Wolff-Parkinson-White syndrome. Both patterns may display retrograde P waves after the QRS complexes. The left panel depicts antidromic atrioventricular reentrant tachycardia. 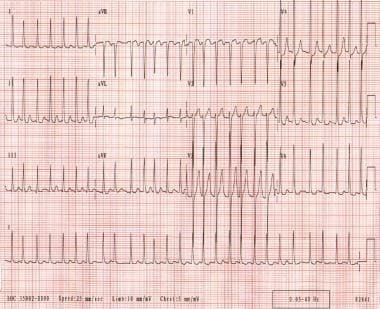 The right panel depicts sinus rhythm in a patient with antidromic atrioventricular reentrant tachycardia. Note that the QRS complex is an exaggeration of the delta wave during sinus rhythm. 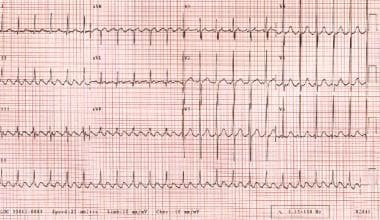 Atrial fibrillation in a patient with Wolff-Parkinson-White syndrome. Note the extremely rapid ventricular rate and variability in QRS morphology. Several minutes later, the patient developed ventricular fibrillation. The prevalence of paroxysmal SVT increases with age. AVNRT is seen more commonly in persons who are middle aged or older, while adolescents usually have SVT from an accessory pathway. The relative frequency of tachycardia mediated by an accessory pathway decreases with age. Patients with symptomatic Wolff-Parkinson-White Syndrome (WPW) syndrome have a small risk of sudden death. Otherwise, prognosis in paroxysmal SVT is dependent on any underlying structural heart disease; patients with a structurally normal heart have an excellent prognosis. Paroxysmal SVT may start suddenly and last anywhere from seconds to days. Patients may or may not be symptomatic, depending on their hemodynamic reserve, heart rate, the duration of the paroxysmal SVT, and coexisting diseases. Paroxysmal SVT can result in heart failure, pulmonary edema, myocardial ischemia, and/or myocardial infarction secondary to an increased heart rate in patients with poor left ventricular function. [9, 10, 11] In fact, one study found that one third of patients with SVT experienced syncope or required cardioversion. Incessant SVT can cause tachycardia-induced cardiomyopathy. Patients with WPW syndrome may be at risk for cardiac arrest if they develop atrial fibrillation or atrial flutter in the presence of a rapidly conducting accessory pathway (ie, a pathway with a short anterograde refractory period). Extremely rapid ventricular rates during atrial fibrillation or atrial flutter can cause deterioration to ventricular fibrillation. This complication is unusual and occurs primarily in patients who have had prior symptoms due to WPW syndrome. Sudden death may be the initial presentation of WPW syndrome, but how often this occurs is unclear. In the absence of manifest preexcitation (ie, WPW syndrome), the risk of sudden death with paroxysmal SVT is extremely small. Denes P, Wu D, Dhingra RC, Chuquimia R, Rosen KM. Demonstration of dual A-V nodal pathways in patients with paroxysmal supraventricular tachycardia. Circulation. 1973 Sep. 48(3):549-55. [Medline]. Rosen KM, Mehta A, Miller RA. Demonstration of dual atrioventricular nodal pathways in man. Am J Cardiol. 1974 Feb. 33(2):291-4. [Medline]. Akhtar M, Jazayeri MR, Sra J, Blanck Z, Deshpande S, Dhala A. Atrioventricular nodal reentry. Clinical, electrophysiological, and therapeutic considerations. Circulation. 1993 Jul. 88(1):282-95. [Medline]. Waldo AL, Wit AL. Mechanisms of cardiac arrhythmias. Lancet. 1993 May 8. 341(8854):1189-93. [Medline]. Klein GJ, Sharma AD, Yee R, Guiraudon GM. Classification of supraventricular tachycardias. Am J Cardiol. 1987 Aug 31. 60(6):27D-31D. [Medline]. Basta M, Klein GJ, Yee R, Krahn A, Lee J. Current role of pharmacologic therapy for patients with paroxysmal supraventricular tachycardia. Cardiol Clin. 1997 Nov. 15(4):587-97. [Medline]. Klein GJ, Bashore TM, Sellers TD, Pritchett EL, Smith WM, Gallagher JJ. 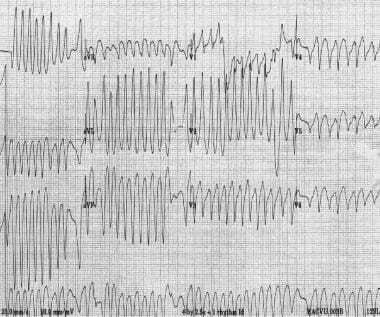 Ventricular fibrillation in the Wolff-Parkinson-White syndrome. N Engl J Med. 1979 Nov 15. 301(20):1080-5. [Medline]. Montoya PT, Brugada P, Smeets J, et al. 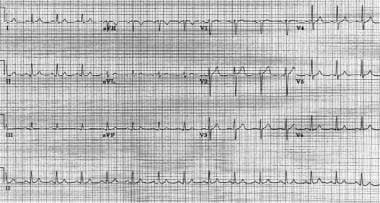 Ventricular fibrillation in the Wolff-Parkinson-White syndrome. Eur Heart J. 1991 Feb. 12(2):144-50. [Medline]. Ganz LI, Friedman PL. Supraventricular tachycardia. N Engl J Med. 1995 Jan 19. 332(3):162-73. [Medline]. Xie B, Thakur RK, Shah CP, Hoon VK. Clinical differentiation of narrow QRS complex tachycardias. Emerg Med Clin North Am. 1998 May. 16(2):295-330. [Medline]. Josephson ME, Zimetbaum PJ, Buxton AE, Marchlinski FE. Tachyarrhythmias. Harrison TR, Resnik WR, Isselbacher KJ, et al, eds. Harrison’s Principles of Internal Medicine [serial online]. New York, NY: McGraw-Hill; 2001. Tintinalli JE, Kelen GD, Stapczynski JS. Emergency Medicine: A Comprehensive Study Guide. 5th ed. New York, NY: McGraw Hill; 2000. Ganz LI. Approach to the patient with supraventricular tachycardia. Ganz LI, ed. Management of Cardiac Arrhythmias. Totowa, NJ: Humana; 2002. 29-49. Bellet S. Clinical Disorders of the Heart Beat. Philadelphia, Pa: Lea & Febiger; 1963. 144-5. 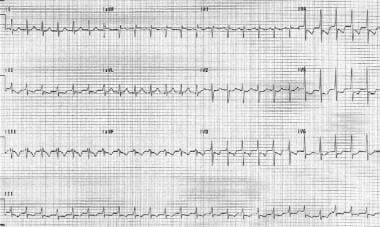 Krahn AD, Yee R, Klein GJ, Morillo C. Inappropriate sinus tachycardia: evaluation and therapy. J Cardiovasc Electrophysiol. 1995 Dec. 6(12):1124-8. [Medline]. Wellens HJ. Value and limitations of programmed electrical stimulation of the heart in the study and treatment of tachycardias. Circulation. 1978 May. 57(5):845-53. [Medline]. Farre J, Wellens HJ. The value of the electrocardiogram in diagnosing site of origin and mechanism of supraventricular tachycardia. Wellens HJJ, Kulbetus HE, eds. What's New in Electrocardiography. The Hague, Belgium; Martinus Nijhoff; 1981. 131-71. Brugada P, Wellens HJ. The role of triggered activity in clinical ventricular arrhythmias. Pacing Clin Electrophysiol. 1984 Mar. 7(2):260-71. [Medline]. Lesh MD, Van Hare GF, Epstein LM, et al. Radiofrequency catheter ablation of atrial arrhythmias. Results and mechanisms. Circulation. 1994 Mar. 89(3):1074-89. [Medline]. Phillips J, Spano J, Burch G. Chaotic atrial mechanism. Am Heart J. 1969 Aug. 78(2):171-9. [Medline]. Habibzadeh MA. Multifocal atrial tachycardia: a 66 month follow-up of 50 patients. Heart Lung. 1980 Mar-Apr. 9(2):328-35. [Medline]. Scher DL, Arsura EL. Multifocal atrial tachycardia: mechanisms, clinical correlates, and treatment. Am Heart J. 1989 Sep. 118(3):574-80. [Medline]. Akhtar M. Supraventricular tachycardias. Electrophysiologic mechanisms: diagnosis and pharmacological therapy. Josephson ME, Wellens HJ, eds. Tachycardias: Mechanisms, Diagnosis, Treatment. Philadelphia, Pa: Lea & Febiger; 1984. 137. Josephson ME, Kastor JA. Supraventricular tachycardia: mechanisms and management. Ann Intern Med. 1977 Sep. 87(3):346-58. [Medline]. Jazayeri MR, Hempe SL, Sra JS, et al. Selective transcatheter ablation of the fast and slow pathways using radiofrequency energy in patients with atrioventricular nodal reentrant tachycardia. Circulation. 1992 Apr. 85(4):1318-28. [Medline]. Wu D, Denes P, Amat-Y-Leon F, Wyndham CR, Dhingra R, Rosen KM. An unusual variety of atrioventricular nodal re-entry due to retrograde dual atrioventricular nodal pathways. Circulation. 1977 Jul. 56(1):50-9. [Medline]. Josephson ME, Wellens HJ. Electrophysiologic evaluation of supraventricular tachycardia. Cardiol Clin. 1997 Nov. 15(4):567-86. [Medline]. Wolff L, Parkinson J, White PD. Bundle-branch block with short P-R interval in healthy young people prone to paroxysmal tachycardia. Am Heart J. 1930. 5:685-704. Coumel P, Gourgon R, Fabiato A, Laurent D, Bouvrain Y. 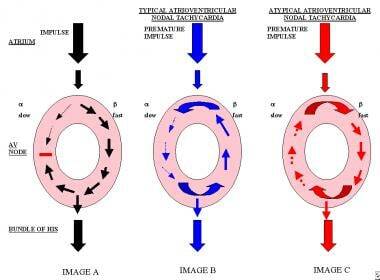 [Studies of assisted circulation. I. Methods of repetitive provoked extrasystole and slowing of effective heart rate]. Arch Mal Coeur Vaiss. 1967 Jan. 60(1):67-88. [Medline]. Gallagher JJ, Sealy WC. The permanent form of junctional reciprocating tachycardia: further elucidation of the underlying mechanism. Eur J Cardiol. 1978 Nov. 8(4-5):413-30. [Medline]. Murdock CJ, Leitch JW, Teo WS, Sharma AD, Yee R, Klein GJ. Characteristics of accessory pathways exhibiting decremental conduction. Am J Cardiol. 1991 Mar 1. 67(6):506-10. [Medline]. Oren JW 4th, Beckman KJ, McClelland JH, Wang X, Lazzara R, Jackman WM. A functional approach to the preexcitation syndromes. Cardiol Clin. 1993 Feb. 11(1):121-49. [Medline]. Bardy GH, Packer DL, German LD, Gallagher JJ. Preexcited reciprocating tachycardia in patients with Wolff-Parkinson-White syndrome: incidence and mechanisms. Circulation. 1984 Sep. 70(3):377-91. [Medline]. Atie J, Brugada P, Brugada J, et al. Clinical and electrophysiologic characteristics of patients with antidromic circus movement tachycardia in the Wolff-Parkinson-White syndrome. Am J Cardiol. 1990 Nov 1. 66(15):1082-91. [Medline]. Obel OA, Camm AJ. Supraventricular tachycardia. ECG diagnosis and anatomy. Eur Heart J. 1997 May. 18 Suppl C:C2-11. [Medline]. Campbell RW, Smith RA, Gallagher JJ, Pritchett EL, Wallace AG. 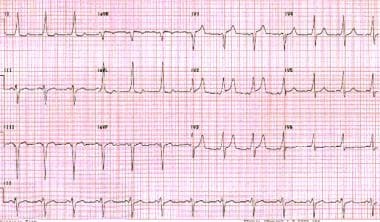 Atrial fibrillation in the preexcitation syndrome. Am J Cardiol. 1977 Oct. 40(4):514-20. [Medline]. Sung RJ, Castellanos A, Mallon SM, Bloom MG, Gelband H, Myerburg RJ. Mechanisms of spontaneous alternation between reciprocating tachycardia and atrial flutter-fibrillation in the Wolff-Parkinson-White syndrome. Circulation. 1977 Sep. 56(3):409-16. [Medline]. Vidaillet HJ Jr, Pressley JC, Henke E, Harrell FE Jr, German LD. Familial occurrence of accessory atrioventricular pathways (preexcitation syndrome). N Engl J Med. 1987 Jul 9. 317(2):65-9. [Medline]. Obel OA, Camm AJ. 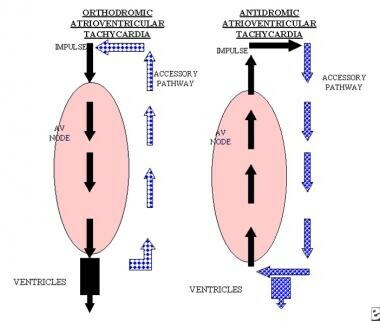 Accessory pathway reciprocating tachycardia. Eur Heart J. 1998 May. 19 Suppl E:E13-24, E50-1. [Medline]. Pieper SJ, Stanton MS. Narrow QRS complex tachycardias. Mayo Clin Proc. 1995 Apr. 70(4):371-5. [Medline]. Trohman RG. Supraventricular tachycardia: implications for the intensivist. Crit Care Med. 2000 Oct. 28(10 Suppl):N129-35. [Medline]. Al-Khatib SM, Pritchett EL. Clinical features of Wolff-Parkinson-White syndrome. Am Heart J. 1999 Sep. 138(3 Pt 1):403-13. [Medline]. Whinnett ZI, Sohaib SM, Davies DW. Diagnosis and management of supraventricular tachycardia. BMJ. 2012. 345:e7769. [Medline]. Naccarelli GV, Varker H, Lin J, Schulman KL. Increasing prevalence of atrial fibrillation and flutter in the United States. Am J Cardiol. 2009 Dec 1. 104(11):1534-9. [Medline]. Orejarena LA, Vidaillet H Jr, DeStefano F, et al. Paroxysmal supraventricular tachycardia in the general population. J Am Coll Cardiol. 1998 Jan. 31(1):150-7. [Medline]. Porter MJ, Morton JB, Denman R, et al. Influence of age and gender on the mechanism of supraventricular tachycardia. Heart Rhythm. 2004 Oct. 1(4):393-6. [Medline]. Tada H, Oral H, Greenstein R, et al. Analysis of age of onset of accessory pathway-mediated tachycardia in men and women. Am J Cardiol. 2002 Feb 15. 89(4):470-1. [Medline]. Wood KA, Drew BJ, Scheinman MM. Frequency of disabling symptoms in supraventricular tachycardia. Am J Cardiol. 1997 Jan 15. 79(2):145-9. [Medline]. Banhidy F, Acs N, Puho EH, Czeizel AE. Paroxysmal supraventricular tachycardia in pregnant women and birth outcomes of their children: a population-based study. Am J Med Genet A. 2015 Aug. 167A(8):1779-86. [Medline]. Connors S, Dorian P. Management of supraventricular tachycardia in the emergency department. Can J Cardiol. 1997 Mar. 13 Suppl A:19A-24A. [Medline]. Levy S, Ricard P. Using the right drug: a treatment algorithm for regular supraventricular tachycardias. Eur Heart J. 1997 May. 18 Suppl C:C27-32. [Medline]. Reimold SC. Avoiding drug problems. The safety of drugs for supraventricular tachycardia. Eur Heart J. 1997 May. 18 Suppl C:C40-4. [Medline]. Gold MR, Josephson ME. Cardiac arrhythmia: current therapy. Hosp Pract (Minneap). 1999 Sep 1. 34(9):27-8, 31-2, 35-8 passim. [Medline]. Siberry GK, Iannone R. The Harriet Lane Handbook: A Manual for Pediatric House Officers. 15th ed. St. Louis, Mo: Mosby-Year Book; 2000. Etheridge SP, Judd VE. Supraventricular tachycardia in infancy: evaluation, management, and follow-up. Arch Pediatr Adolesc Med. 1999 Mar. 153(3):267-71. [Medline]. Campbell RW. Supraventricular tachycardia. Doing the right things. Eur Heart J. 1997 May. 18 Suppl C:C50-3. [Medline]. [Guideline] Blomstrom-Lundqvist C, Scheinman MM, Aliot EM, et al. ACC/AHA/ESC guidelines for the management of patients with supraventricular arrhythmias--executive summary. a report of the American college of cardiology/American heart association task force on practice guidelines and the European society of cardiology committee for practice guidelines (writing committee to develop guidelines for the management of patients with supraventricular arrhythmias) developed in collaboration with NASPE-Heart Rhythm Society. J Am Coll Cardiol. 2003 Oct 15. 42(8):1493-531. [Medline]. Goel R, Srivathsan K, Mookadam M. Supraventricular and ventricular arrhythmias. Prim Care. 2013 Mar. 40(1):43-71. [Medline]. Danelich IM, Reed BN, Hollis IB, Cook AM, Rodgers JE. Clinical update on the management of atrial fibrillation. Pharmacotherapy. 2013 Apr. 33(4):422-46. [Medline]. Cove CL, Hylek EM. An updated review of target-specific oral anticoagulants used in stroke prevention in atrial fibrillation, venous thromboembolic disease, and acute coronary syndromes. J Am Heart Assoc. 2013 Oct 23. 2(5):e000136. [Medline]. [Full Text]. Fu H, Hu H, Yang Q, Cui K, Chu N, Jiang J. [A retrospective study of 4865 cases of paroxysmal supraventricular tachycardia treated with catheter ablation]. Sheng Wu Yi Xue Gong Cheng Xue Za Zhi. 2009 Jun. 26(3):499-503. [Medline]. Scheinman MM. Catheter ablation for cardiac arrhythmias, personnel, and facilities. North American Society of Pacing and Electrophysiology Ad Hoc Committee on Catheter Ablation. Pacing Clin Electrophysiol. 1992 May. 15(5):715-21. [Medline]. Strickberger SA, Okishige K, Meyerovitz M, Shea J, Friedman PL. Evaluation of possible long-term adverse consequences of radiofrequency ablation of accessory pathways. Am J Cardiol. 1993 Feb 15. 71(5):473-5. [Medline]. Mainigi SK, Almuti K, Figueredo VM, et al. Usefulness of radiofrequency ablation of supraventricular tachycardia to decrease inappropriate shocks from implantable cardioverter-defibrillators. Am J Cardiol. 2012 Jan 15. 109(2):231-7. [Medline]. Bohnen M, Stevenson WG, Tedrow UB, et al. Incidence and predictors of major complications from contemporary catheter ablation to treat cardiac arrhythmias. Heart Rhythm. 2011 Nov. 8(11):1661-6. [Medline]. Kireyev D, Fernandez SF, Gupta V, Arkhipov MV, Paris JA. Targeting tachycardia: diagnostic tips and tools. J Fam Pract. 2012 May. 61(5):258-63. [Medline]. Link MS. Clinical practice. Evaluation and initial treatment of supraventricular tachycardia. N Engl J Med. 2012 Oct 11. 367(15):1438-48. [Medline]. Misikova S, Stancak B, Sudzinova A. Catheter ablations of supraventricular tachycardias. Bratisl Lek Listy. 2012. 113(4):237-9. [Medline]. Lauschke J, Schneider J, Schneider R, et al. Electrophysiological studies in patients with paroxysmal supraventricular tachycardias but no electrocardiogram documentation: findings from a prospective registry. Europace. 2015 May. 17(5):801-6. [Medline]. Shaker H, Jahanian F, Fathi M, Zare M. Oral verapamil in paroxysmal supraventricular tachycardia recurrence control: a randomized clinical trial. Ther Adv Cardiovasc Dis. 2015 Feb. 9(1):4-9. [Medline].